I need to add several more birthday cards to my stash and most of them need to be CAS and masculine. Fortunately, I love doing both of those and even better when I can combine them. 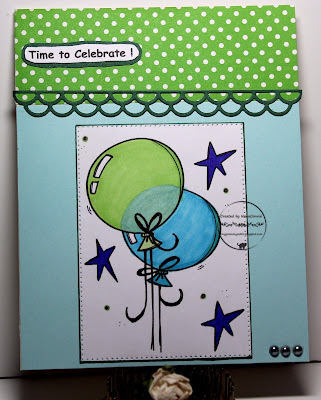 I've had this balloon image (Bugaboo Stamps) for a while and I can't remember ever using it but I love the color combo from the Catch the Bug challenge this week and knew it would work wonderfully with this image. 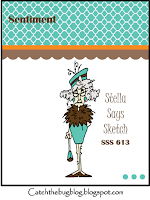 sketch from Stella Says Sketch. 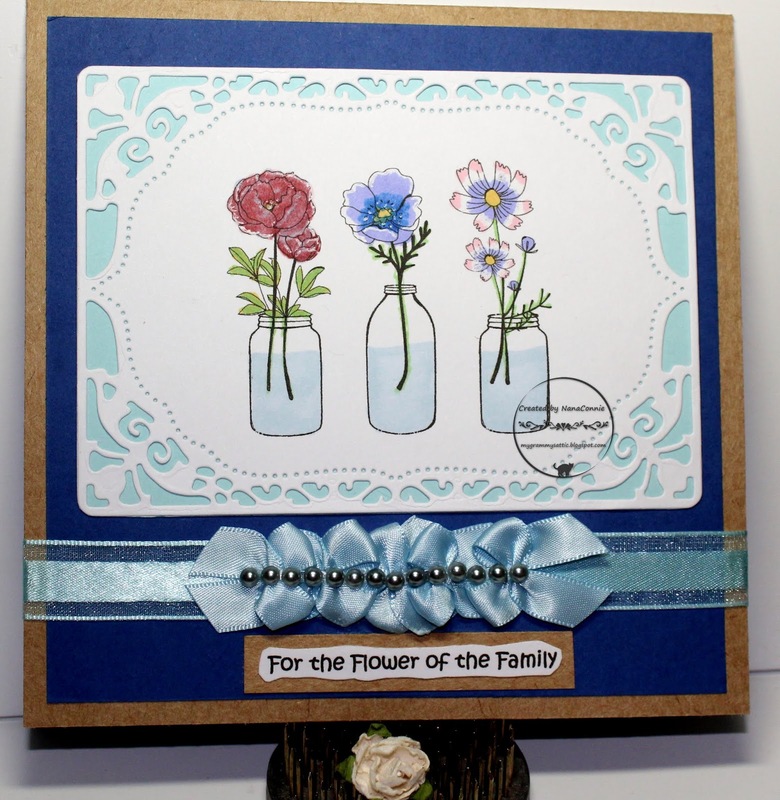 The scalloped border piece, which I used across the middle of the card, was cut with a die from Cheery Lynn. I printed the sentiment, hand cut it, matted it with dark green CS, and added it to the top of the card. I found the three, blue pearls and added them to the bottom corner. That was it - a CAS and masculine card for the birthday stash. I haven't done a tall and skinny card for ages, it seems, but this one for Halloween (done with a Penny Black stamp) just had to be tall to get the effect of the entire scene. Take a look - you'll see right away what I mean. I colored the cute hedgie witches on their broom with my ProMarkers and die cut them with a Sizzix die. I inked the edges with a deep, purple marker. 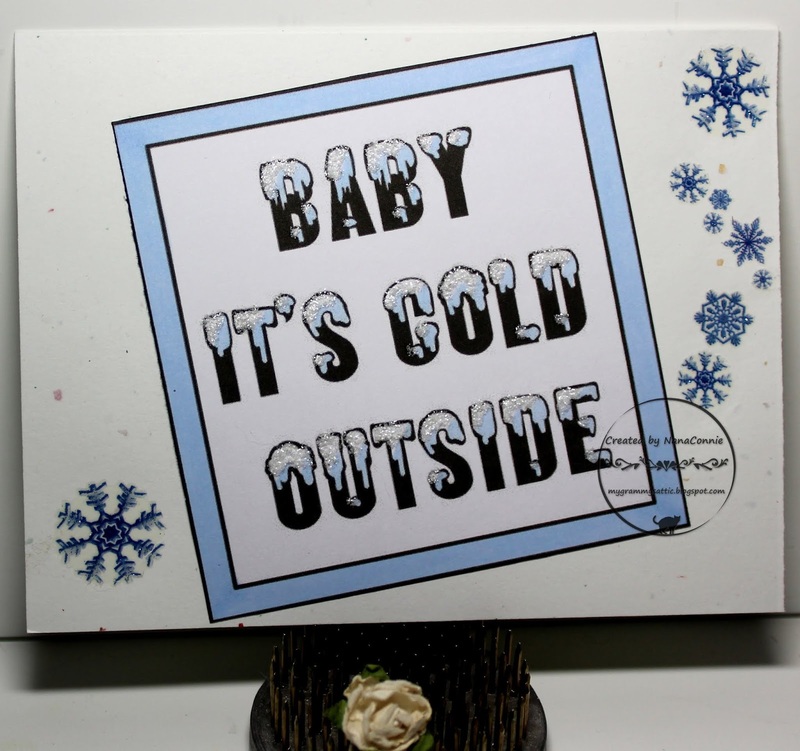 I printed and cut the sentiment with another Sizzix die. 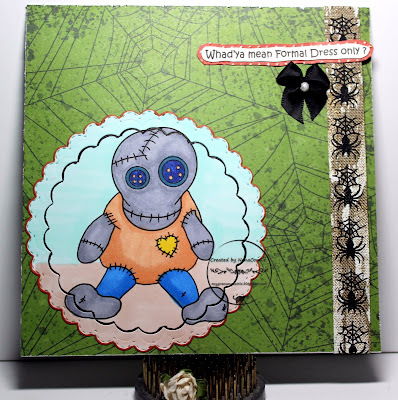 The background is done entirely with papers from a Making Memories Halloween stack. I had to trim things to fit the card size but I loved figuring out the how and where of placement for the papers and scrap bits. I decided that I only needed minimal embellishment so I tied a black ribbon bow and added a tiny gem to it. The pumpkins in the garden are getting bigger, fatter, and more orange each day. The rest of the crops are pretty much done for the year even though my tomato plants are still looking healthy and are massive in size. I was inspired to dig out this delightful image from Sandi Huggett which I used nearly every fall; sometimes for Halloween, sometimes for Thanksgiving. This year it's just for a celebration of the harvest season. 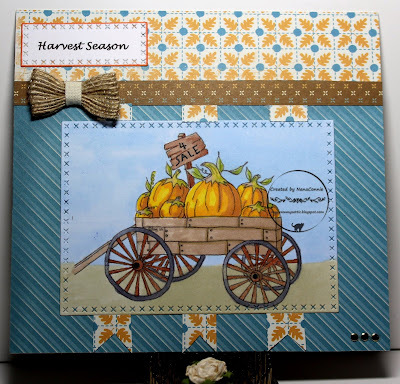 I started with water colors on the sky and ground, then colored the rest of wagons and pumpkins with ProMarkers. I cut the image with an Unbranded, Cross Stitch Rectangle die. I wanted dp which had fall colors but also had blue. I found two scraps of dp in my basket, neither of which was large enough to cover the entire card front so I combined them. I think hedgies are my favorite critters (don't tell the cats!) especially for making cards. 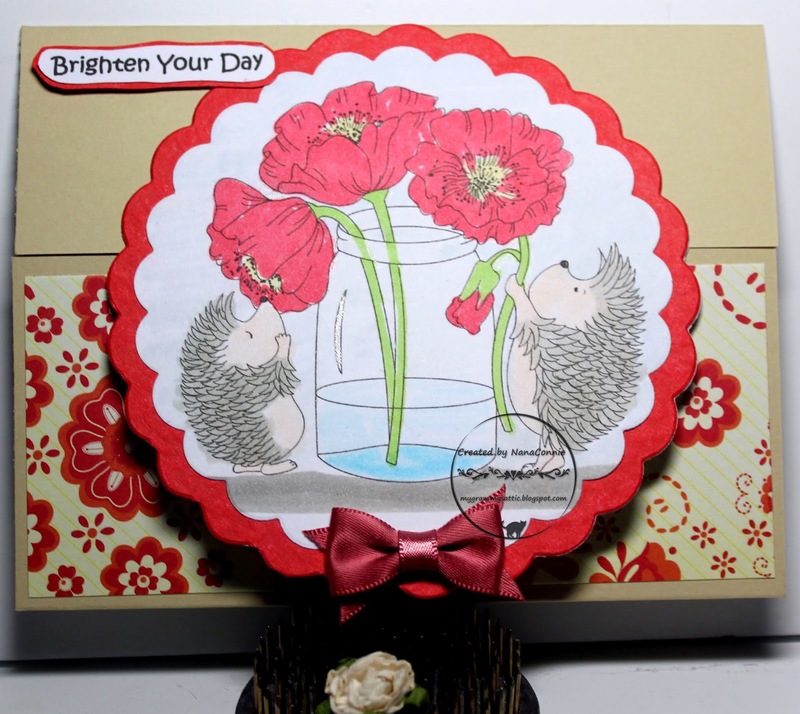 Poppies are one of my favorite flowers so this darling image from Di's Digi Designs was a delight to color. When I checked their current challenge theme, they want to see Fancy Folds so I took a standard gate fold card and turned it sideways so that the 'gate' opens top and bottom. Sounds weird, I know, but let me show you the pic and you'll immediately see what I mean. I used water colors on the image and cut it and the frame with scalloped circle dies from Sizzix. I used kraft CS to make the card base and scored an 8.5 inch x 5.5 inch piece at the 1.5 inch line and the 2.5 inch line, leaving the middle section 5.5 x 4.25 (standard A2 size.) The dp (Recollections) was a scrap and it worked perfectly with the color combo - beige background to complement the kraft and red flowers to pair up with the image and frame. I folded on the score lines and adhered the image to the top flap. I tied a bowtie bow, dyed it red with a ProMarker, and added it to the bottom of the image. Finally, I printed the sentiment, hand cut it and matted it with a scrap of red CS, then hand cut it again, attaching it at the top of the card. I have two more Christmas cards to share today, both using image sentiments as the focus. These are from Limited Runs and I've used four of these Christmas sentiments to make a dozen CAS Christmas cards for my stash. The coloring on each one was done with ProMarkers. On the top one, I used "Frosted Lace" Stickles for the snow on the letters. The snowflakes are rub-ons which have been in my stash at least 5 years. It was about time I used them! On the bottom one, I used ribbon from my Christmas stash and tied a tiny bow, white originally but dyed red with a ProMarker. 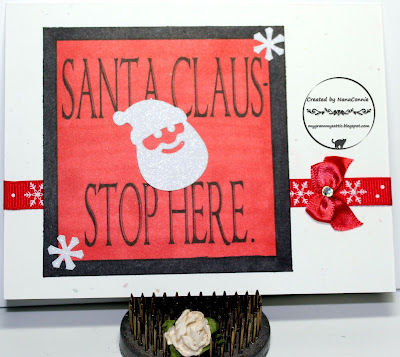 The Santa and the snowflakes on that one are simple foam stickers to which I added glitter. That's two more quick, CAS cards for the Christmas stash. Here's the sketch for this week but I turned it a quarter turn and reversed the layers because that better fit my image shape. I used ProMarkers to color sweet Pippa, then cut her with a Bo Bunny die. 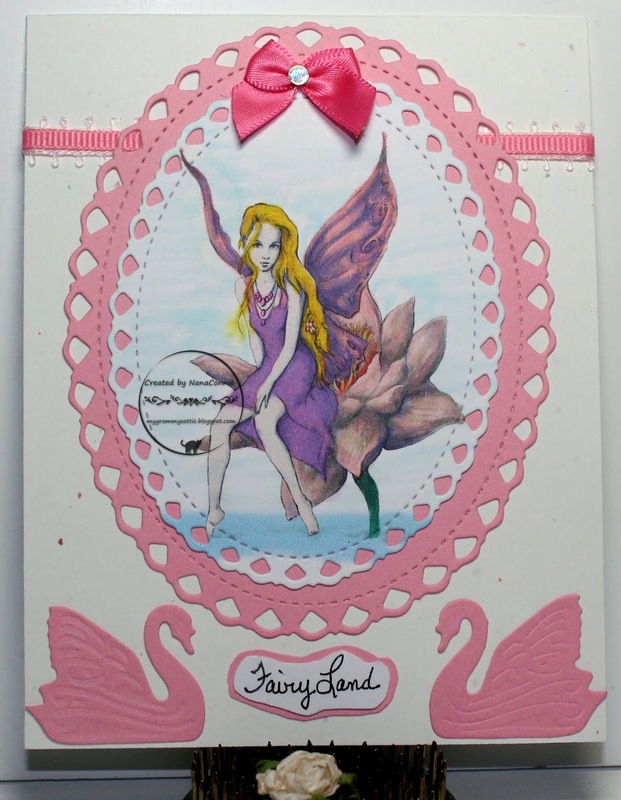 I used another die from that same set to cut the delicate, pink frame and inlaid the two. The dp rectangle came from my scrap basket and didn't even need trimming; it was the perfect size as it was. I printed and hand cut the sentiment, then began looking for a single embellishment. I thought about a flower but decided on the two-tone, bowtie, bow. 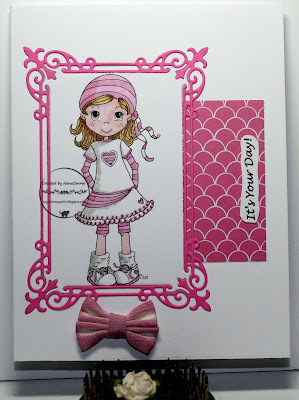 I'm loving the monochromatic pink of this card. The newest challenge starts today over at QKR Stampede and our theme is the usual "Anything Goes." I made this card for a friend who has donated more than 1500 hours of labor to Habitat for Humanity over the last 10 years. He doesn't even talk about the amount of materials he's also donated. 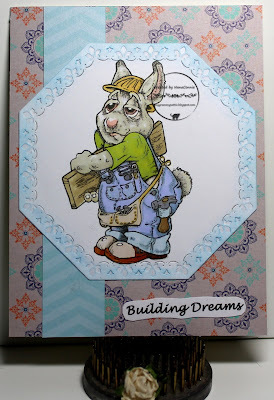 I just wanted to give him a pat on the back and this QKR Stampede image called "Carpenter Rabbit" seemed perfect. I was inspired by the sketch at My Favorite Things. The image is colored with ProMarkers, then cut with a die from Spellbinders. I used chalk to highlight the embossing around the edges of the die cut. The sentiment image is from Limited Runs and I printed it large enough to take up almost 3/4 of this card. 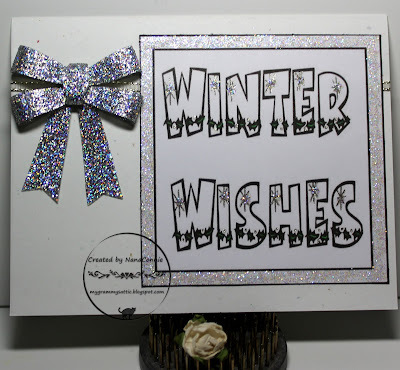 I used sparkle gel pen to 'color' the snowflakes in the letters and used "Diamond" glitter to make the frame. I had the very narrow white and gold ribbon in my Christmas stash and I wrapped it around the card front before adding the sentiment piece. The iridescent glittered bow is made from die cut pieces. Unfortunately, I don't know who made the die. I made half a dozen of the bows at a crafting party we set up for exchanging the use of dies. Someone brought that die as her contribution to the party and anyone interested could use it. If you've never done that kind of crafting party, you really should think about organizing one. I think we had about 10 ladies who attended, each one bringing some kind of unusual die (it could be any crafting tool or supply, depending on what interests the group) and each person brought their own paper and CS supplies. I also took images I had already colored because I knew one of the ladies was bringing a set of framing dies which I could use to cut them. But, back to this bow - I assembled it (totally new for me - I've never "assembled" bows before - tied them, yes, but not "assembled"!) and added it to the narrow ribbon, nearly obscuring that poor ribbon altogether! With all that sparkle, I called it finished and added it to my Christmas stash. I realize that card is mostly black and white but the glitter on the bow is a lovely shade of winter-y lavender and it's just so stunning. 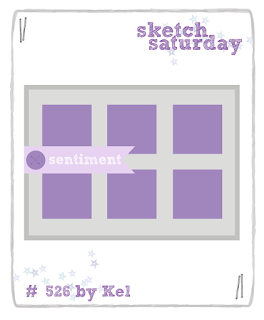 I love any shade of purple (my favorite color) but in this case I love it because, with everything else black and white, it adds a deliciously icy sheen to this winter weather card! Anyway, when I first saw the Dandelion Sprite image at AuroraWings, I bought it and I'm using it on this card today to celebrate a friend's birthday. 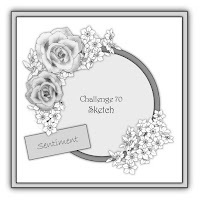 AuroraWings has a sketch challenge this month. I colored with ProMarkers, added glitter to the dandelion and seeds, and used Nuvo Crystal Drops on the sprite's flower petals. The image was cut with stitched dies from Die-Namics. I also cut the yellow background CS with the largest of those dies and inlaid the image. I printed and hand cut the sentiment, inked the edges and adhered it to the card. 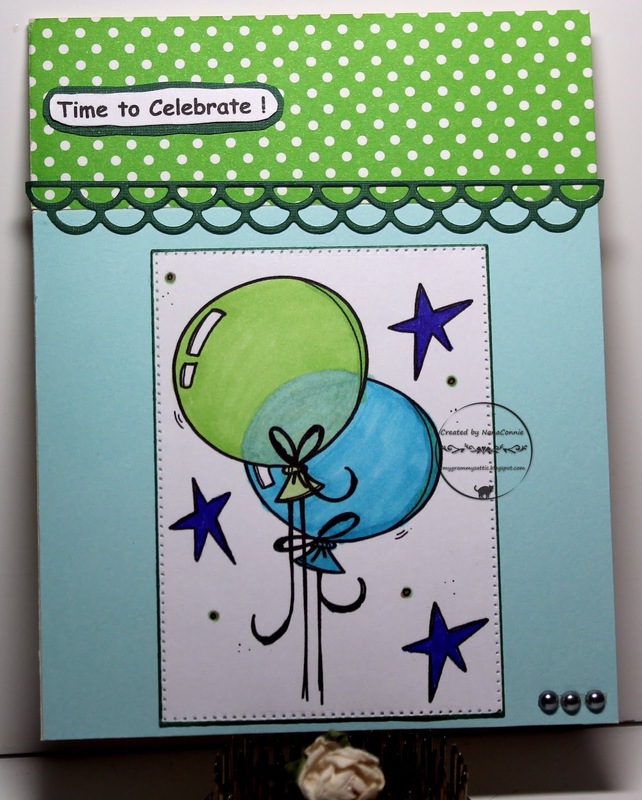 I added the birthday sentiment to the inside but forgot to photograph it and the card is already in the mail. Since I was the baby and only girl among the siblings, my dad always said I was the "Flower" of the family. In my teen years, my older brother said that was because I was a "bloomin' idiot!" lol Whatever the reason, I used that phrase as the sentiment on this card which features an image from All Dressed Up. I was inspired by the colors at House of Cards. This one is colored with a combo of polychromos pencils and ProMarkers, then cut with an Unbranded die. I matted the die cut image piece with light blue CS and trimmed the corners. I mounted that onto dark blue CS and put that onto a kraft card base. I dug through my stash of ribbon and found two, matching-in-color, ribbons from completely different companies. I used one to wrap the card front and the other to make a 'ruched' bow to which I added a row of pearls. I printed the sentiment, hand cut it, then matted it with a scrap of kraft CS. I added that to the bottom of the dark blue CS. I've spent the weekend doing both Christmas and Halloween themed cards and today I'm sharing one of the fall/Halloween cards. 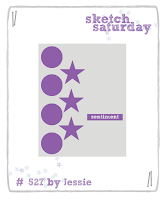 The stamp is from Digistamps4Joy and I think it's adorable. 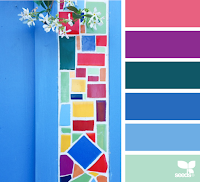 I was inspired by the colors in the mood board at Sum More Fun. I used ProMarkers to color the image and white gel ink to make the stars. I cut the moon from white CS (colored with ProMarkers), added it to the corner, then cut the entire image with a Tonic Studios die. I printed the sentiment, cut it with another Tonic Studios die, matted it with yellow CS, and cut that with my paper cutter. 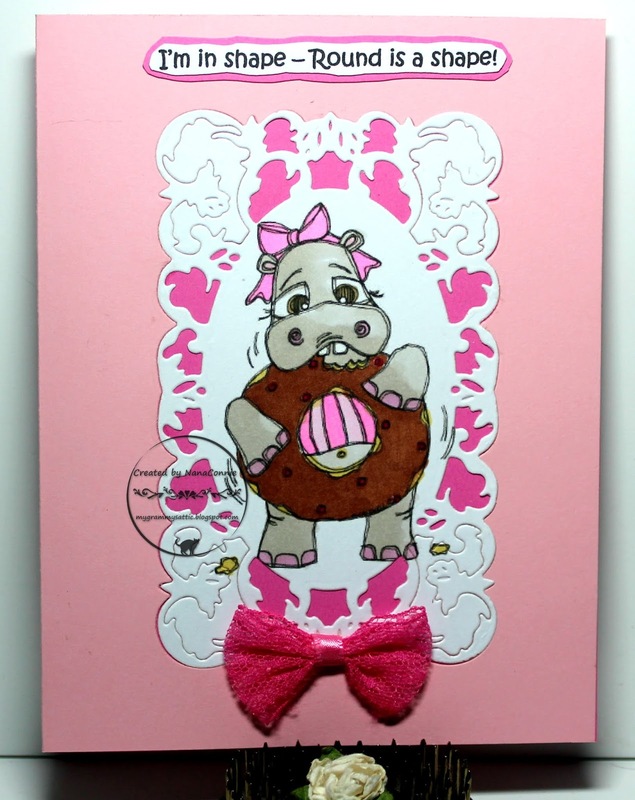 I added everything to an embossed card front and found a lace bowtie to add. I left it CAS because it will be sent to one of the guys in my family. Limited Runs has some wonderful Christmas images but I'm showcasing a very simple and large sentiment. I'm going to make at least a dozen cards just like this one because it's one of those really quick, "git 'er done" (as my friend, Lynn, says) cards which is flat enough to mail. 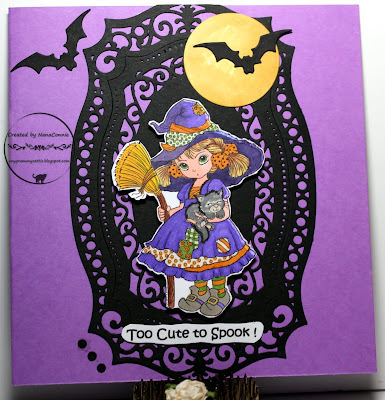 OK, this weekend I've gotten inspired to make a few Halloween cards and I started with this darling little witch from Conie Fong. Who could resist that cute face and that sweet little kitten cuddled in her arm? turning it a quarter turn and I also took a bit of a liberty with it. She's colored with ProMarkers, then fussy cut. 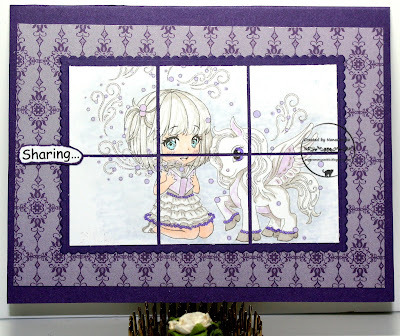 I used a set of framing dies from Spellbinders to cut the black piece behind the image. I cut those from different pieces of scrap CS and inlaid them to make the one, large framing piece. 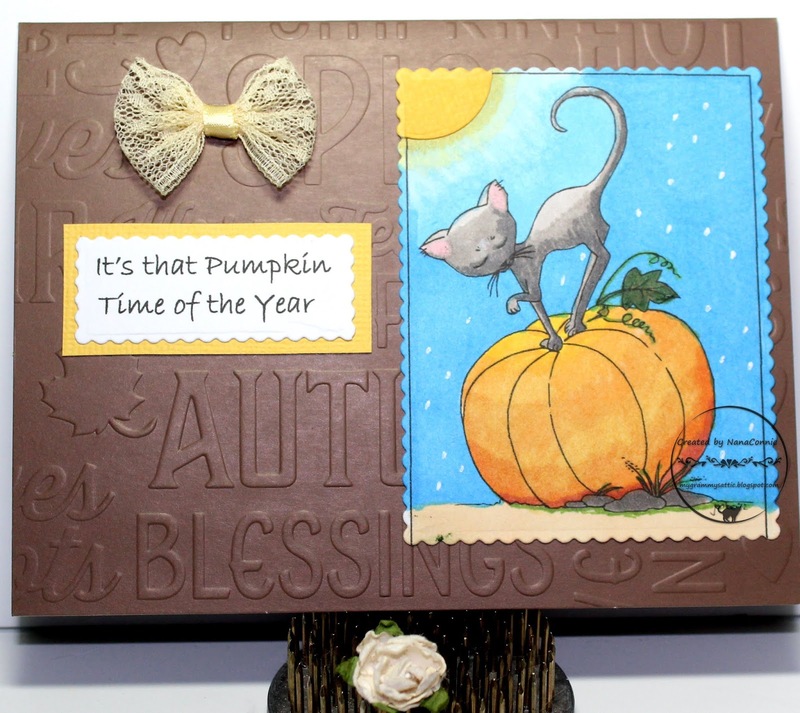 The 'moon' is cut with a plain circle die from QuicKutz and the bats are cut with a Cottage Cutz die. Those were also cut from scrap bits rescued from the trash can. I printed and hand cut the sentiment. The three tiny dots are negative pieces which fell out of the Spellbinders die cut and I just used them like gem embellies. Here's the sketch for this week. I started with a pre-colored image and then used ProMarkers to change the colors of the hat, hair and dress on little Miss Sunshine. I cut the image with a large, rectangle die from QuicKutz, then I fussy cut her along the right side. The background paper is from that Paper Shelter set, too. The little flower and star embellishments are large sequins. I printed the sentiment, hand cut it, and inked the edges before adding it to the card front. Aside from the sequins, the card design is pretty CAS. I love Fridays! It means I get to share another fun card with a silly and delightful QKR Stampede image. Our newest challenge starts today and will run for a week. I've used "Playing Tennis." I colored the tennis star with ProMarkers and used water colors on the background. I cut the image with a die from Spellbinders. I found two scraps of paper in the basket, neither of them big enough to make the frame, so I cut each one (again, Spellbinders) and then layered them together on a diagonal to frame the image. I printed the sentiment, hand cut it, and inked the edges before adding it to the card. 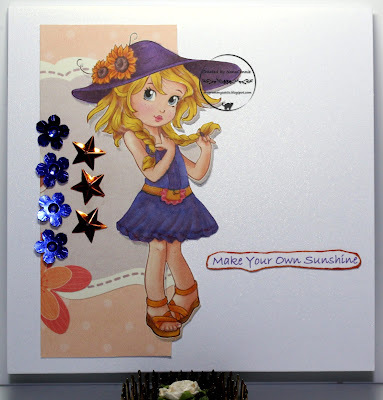 I used tiny gems from Stampendous for a bit of sparkle. The bow is made from a strip of lace. I did several of those all in one afternoon, trying to use up various scraps of lace which were in my ribbon stash. I got more than two dozen bows using those scraps. The sentiment was printed, hand cut, matted, and hand cut again. 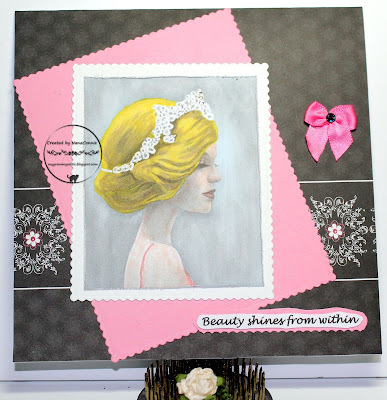 There's a brand new challenge starting today called "Creations in Pink" and I'm delighted to tell you that I was chosen as one of the DT members! In simple terms, the challenge runs monthly on the 15th of each month and the primary requirement is to use lots of pink on your projects. Other than that, it's pretty much Anything Goes. How easy is that? This month, our sponsor is Fabrika Fantasy and they generously supplied images for the DT to use. I used "Water Fairy, who looks so lovely and "summer-y." Isn't she a fabulous stamp? I colored her with ProMarkers and cut her with an Unbranded die. 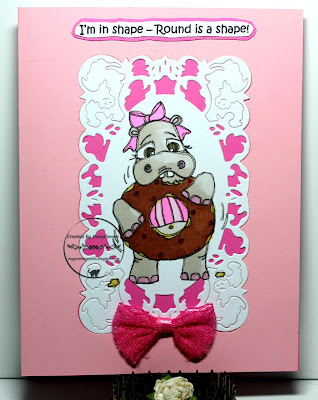 I cut the pink frame with a larger die from that same set. The swans are also cut with Unbranded dies. I added narrow pink ribbon and a pink ribbon bow. The sentiment was printed, hand cut, matted, hand cut again, and added between the swans. I hope you'll bookmark our challenge and come play along each month. You can also find us on the "By Date, Not Days" list at Challenges for Days, a great resource for finding challenges you may want to enter. It's mid-month and that means a new challenge is starting at World Wide Open DT, always sponsored by Julia Spiri and her magnificent images! I've used one of the newer images, "Portrait Girl" which is done in gray scale and I used water colors to bring her to life. After water coloring, the image was die cut and the edges were distressed. I used a larger Tonic Studios scalloped die to cut the white frame and the another to cut the pink CS piece. Those were layered together before printing and fussy cutting the sentiment. I matted the sentiment with a scrap of pink CS and added it to the image piece. I found the scrap of black dp in my stash and it's been around for so long, I don't even know who made it. The pink bow is one I sewed together by hand and then added a tiny gem to it. I love the soft feel of this image and I hope it carried over to the entire card. I'm sharing a card this morning which was the result of my daughter challenging me to CASE a photo she found on the internet. It was this picture of a beautiful peacock. 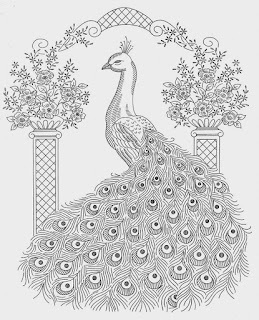 I searched my files for a peacock image but the only two I had were pre-colored and I felt that wouldn't fit what she wanted to see from me. I haven't collected many peacock images just because coloring them intimidates me. However, I did find an embroidery pattern which I scanned and reduced to make it feel a bit like a digi image. I've never tried coloring embroidery patterns before although I've embroidered my share of them with embroidery floss. :-D Here's what it looks like after I scanned it. And here's what I did with it. I colored with ProMarkers, adding super fine glitter to the head and neck and using gold paint pen on the lattice work. I also used gold paint on the edges of the image after die cutting it with a rectangle die from Tonic Studios. I'm thinking that I might like to try coloring this one again but using my polychromos pencils. I'm sure it will give a very different look to that magnificent bird. I knew I wanted to bring out the main colors in the peacock so I used another Tonic Studios rectangle die to cut scraps of turquoise and green CS. I put those together on an angle, then layered on the image. 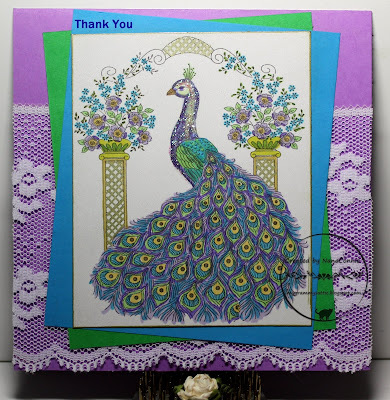 I chose a purple CS scrap to make the card front and added a scrap of lace to it before adding the image. I added the sentiment but did not embellish the card because I didn't want anything to distract from the peacock. 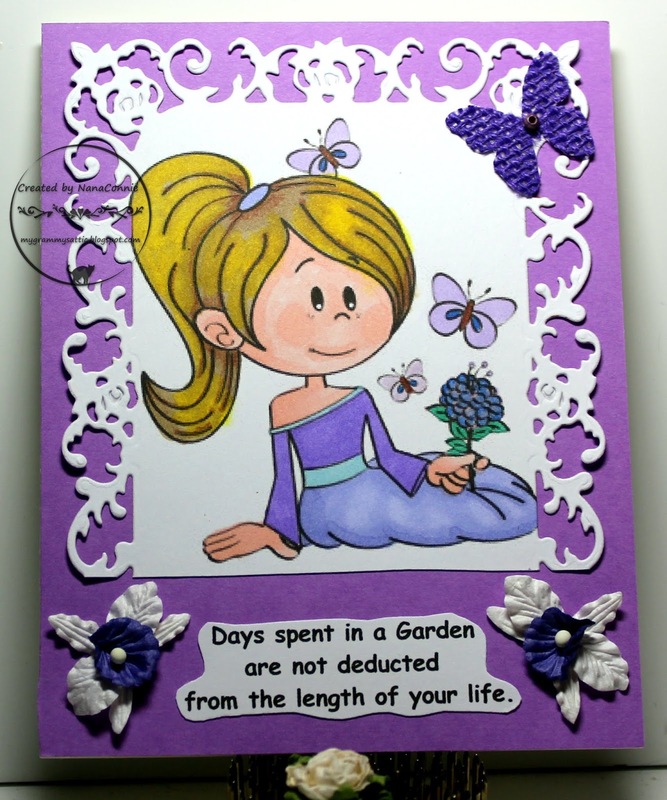 I dearly love this sweet image of a girl in her garden for the Sasayaki Glitter Progressive Challenge this month. It's called "Butterfly Garden." 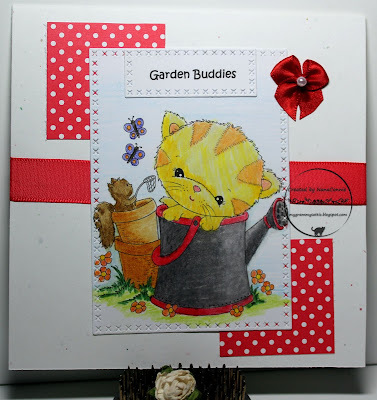 I colored with ProMarkers, the cut the image with a die from Spellbinders. That got mounted onto purple CS which became the card front. I printed the sentiment , hand cut it, and added it below the image. 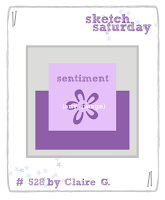 I'm a Guest Designer for Sketch Saturday this month and this is my second card for them but a completely new sketch. They have new sketches and new challenges each week. The sketch this week was both fun and fancy. A quick personal story - I first discovered Pegasus through reading. As a child, summer meant plenty of reading time (without any teachers telling you what you had to read) and one summer, I discovered Greek Mythology. That led to a love of all fantasy creatures and to this day, unicorns, fairies, mermaids, and especially Pegasus, all mean summer time to me. I colored with ProMarkers, deciding to use a monochromatic range of my favorite color, purple. 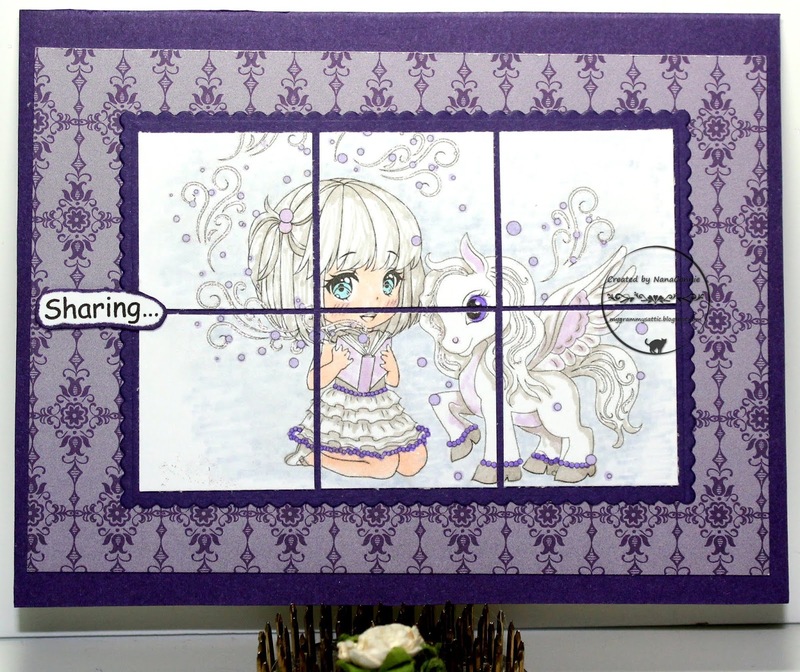 I cut the image and purple frame with dies from my newest Tonic Studios set. I love that die set. 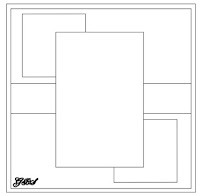 It has alternating sizes of plain and scalloped rectangles. Once I had the image cut with the die, I carefully cut it into 6 "inchie" squares. I laid those out on the frame piece, spacing them carefully to get the 'window' look. 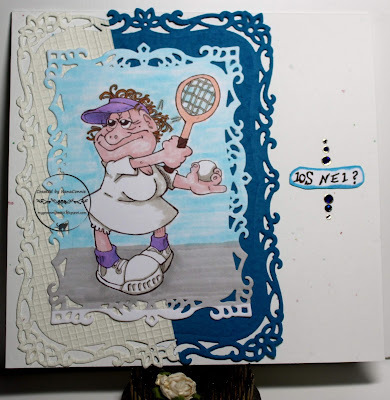 Once adhered, I layered that entire piece onto the background dp (Stampin' Up), then put that onto deep purple CS. I printed and added the sentiment, substituting it for the little flag piece. Good Friday Morning! We have a new challenge starting today at QKR Stampede where our theme is always "Anything Goes." 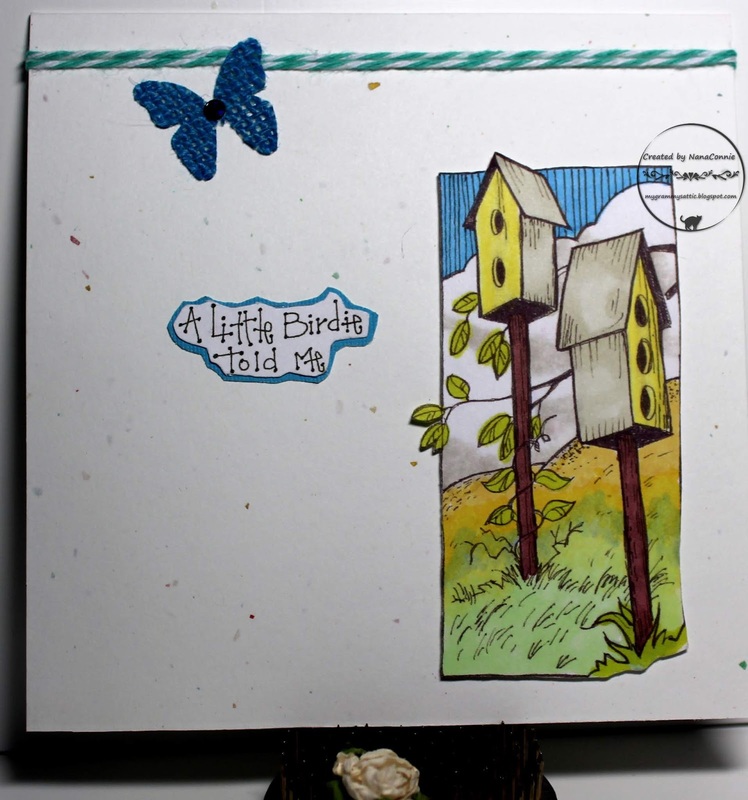 I took the opportunity to add another birthday card to my stash with this CAS design using QKR image "Birdhouses" and sentiment "Birdie Told Me." Remember that QKR Stampede images come in both rubber and digital, whichever is your preference. 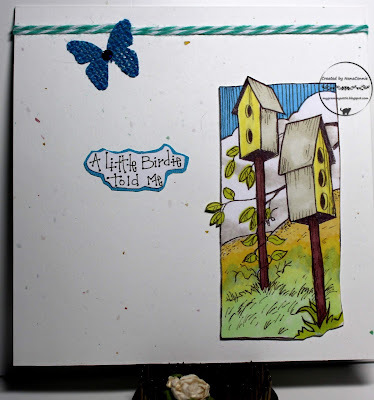 I colored the birdhouses and background in the image with ProMarkers and polychromos pencils, then fussy cut it leaving two spots where the image went 'off the edge.' To give a little texture and dimension, I stacked the image onto 3 more layers of CS, hand cutting each one as I added it so that the final image piece is 4 layers of CS. I inked the edges to make it pop a bit. 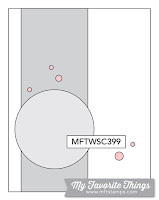 I adhered that onto a confetti CS base. I printed the sentiment, matted it with turquoise CS, and hand cut that. I used baker's twine to wrap the card and die cut (Cheery Lynn) a butterfly out of burlap paper. I 'dyed' it with a ProMarker, then added one tiny rhinestone to the butterfly body for a bit of sparkle and called it finished. OK, I'm done with summer! I officially hate hot weather, I'm tired of day after day of temperatures over 100F, I'm tired of heat waves, and I don't want to hear the meteorologists tell us one more time to stay indoors because of bad air quality! That part is really sad because outside is my favorite place to be if I'm not in the craft room. I want it to be autumn and I want crisp, cool nights, not Hot August Nights. 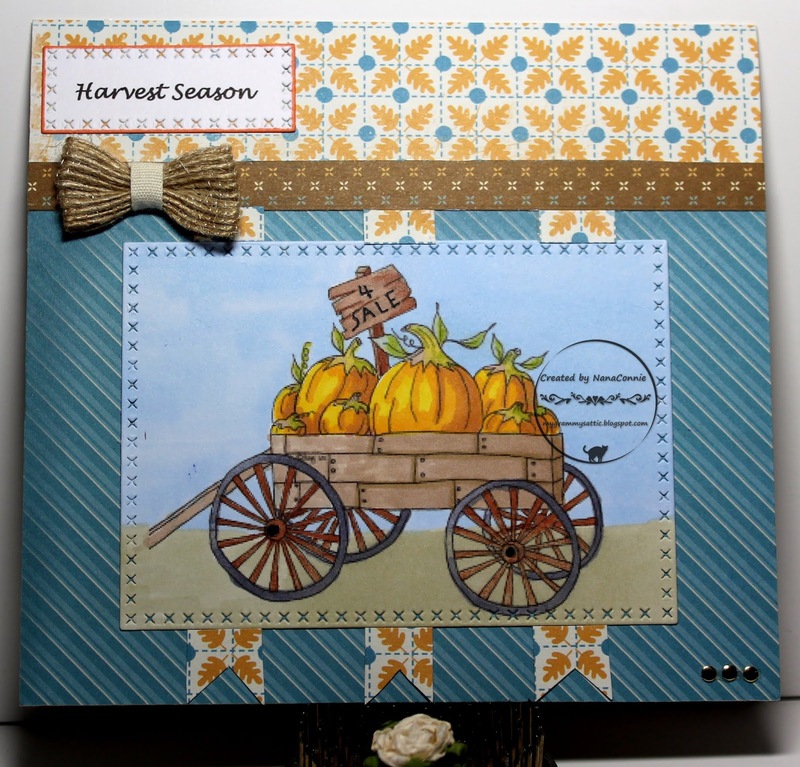 I'm not doing any more summer cards - only fall and winter. Maybe that will bring in cooler temperatures. 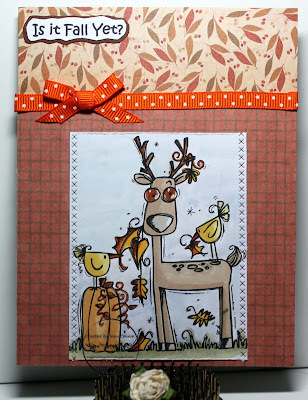 :-D The image on this autumn card is from Bugaboo Stamps and I love this autumn deer. I started with the sketch at Stella Says Sketch. 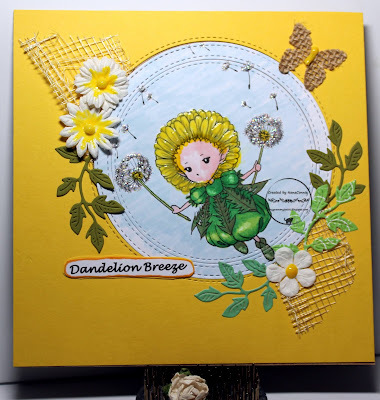 I colored with ProMarkers, then used one of my Stitched Border dies from Lawn Fawn along each side of it. I trimmed it top and bottom with a paper cutter and distressed the edges. Both papers came from one of my DCWV autumn stacks which have been in my stash for more than 5 years now. I use them up slowly but surely and, while they last, I don't have to buy any new fall paper stacks. I found the orange, polka dot ribbon in my stash, wrapped it around and then hand tied the bow. I printed the sentiments, cut it by hand, matted it, hand cut it again, then added it to the top corner. Today's card was done for the Progressive Challenge at Limited Runs and it has a story line. Did you know that every year the ghosties and goblins throw an annual Ball? It's usually an "invitation only" event but this year a young zombie showed up, hoping to gain access. He was excluded, however, for lacking the proper dress. Coloring was done with ProMarkers, and I used a Sizzix die to cut the inner scalloped circle and a Memory Box stitched scalloped die to cut the larger circle. I inked the edges of each one and inlaid them. The background dp (Making Memories) and the spidery ribbon were both in my Halloween stash and they seemed to work well with this particular design. I printed and hand cut the sentiment, matted it with a bit of dp, then 'dyed' the little bow black with a ProMarker. I found this image in my collection of Di's Digi Designs and decided that I would color it with my polychromos pencils. When it was finished, I cut it with one of my newest dies, an Unbranded cross stitch rectangle, and I used the smallest one from that set to cut the sentiment. I needed to get this one done quickly (since the fur babies were glaring at me) and I had already spent a good 45 minutes coloring, so I looked through various sketches and settled on the one from Cheerful Sketches. Without a sketch, I can spend an hour or more fiddling with design ideas, laying things out, re-arranging them, and re-arranging again. No time for that this morning! Everything on the card came from scraps in my stash. The bit of red ribbon and the polka dot dp worked well together so I grabbed them, trimmed the dp squares to a suitable size, distressed the edges a bit, and layered them onto a card base made from a leftover piece of confetti CS. I dug out one of those white bows I sew up by the dozens, used a marker to 'dye' it red, and added it as the one embellishment on the card. I called it finished and rushed around to get it photographed and ready to post.